Who is your perfect patient? This may not be something you’ve spent much time thinking about – but it should be. Knowing your perfect patient is key to creating a winning chiropractic marketing campaign. If the only goal of your current marketing plan is to reach anyone who is warmer than room temperature, that could be the reason it’s falling flat. If you know who your perfect patient is, then you know exactly where to find them. In other words, you can go to them instead of waiting for them to come to you. Example: If your perfect patient is a working mom, then you can optimize your Facebook ads, for instance, to target working mothers in your area. Or you can host a lunch and learn on the admitting complaints you see most with working moms, like migraines or carpal tunnel. 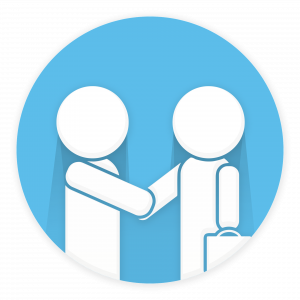 If you know who your perfect patient is, then you can customize your website, services, and specials just for them. Using the working moms example from above, your website should be tailored to that audience. Have a play area for kids to wait while mom gets adjusted? Showcase photos of it on your site. Open Saturday mornings? Feature that on your homepage. Make it so that when a working mom visits your website, scheduling an appointment with you is a “no-brainer” decision. Ask your staff to list four or five of their favorite patients on a piece of paper, without sharing their list with the rest of the team. Once everyone has their list, compare notes. One of two things will emerge from this process: Either everyone mentions pretty much the same list of names (Congratulations! ), or they are all over the place and quite different from your list (You have work to do). If you came out of this exercise with a cohesive list of names, then great! All you have to do is find the common ground between these patients to determine what makes them so perfect. The infographic below will help you with some of the finer details. If you all had a different picture of your perfect patient, then don’t worry. You can still go through your lists and identify why each staff member chose the patients they did. For both of these cases, we’ve created the infographic below to guide you through identifying your perfect patient. There isn’t a right or wrong answer to any of these questions. Our goal is to help you pinpoint the types of patients you enjoy seeing the most. For example, your ideal schedule affects the patients you want to see. If you prefer morning appointments, then you should aim some of your chiropractic marketing efforts toward retirees or stay-at-home moms. Or maybe you really enjoy educating patients about chiropractic care and would love to convert more skeptics. In this case, you might want to start a blog and/or social media profiles to educate people online and promote your practice as a “safe space” for questions about chiropractic care. You can use these questions to build an image of your perfect patient and then customize your chiropractic marketing efforts just for them. You may have 2 or 3 types of perfect patients – and that’s okay! This is all about knowing what you enjoy most about treating your patients and finding more who are looking for those services. If you have more than one type of perfect patient, then it might be helpful to give them each names and descriptions to distinguish their needs from one another. 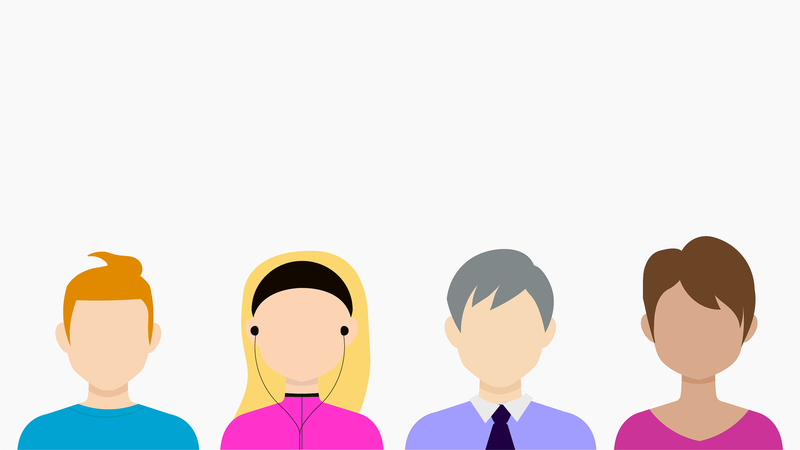 For some ideas on how to do this, check out this resource on targeting personas in the health industry. 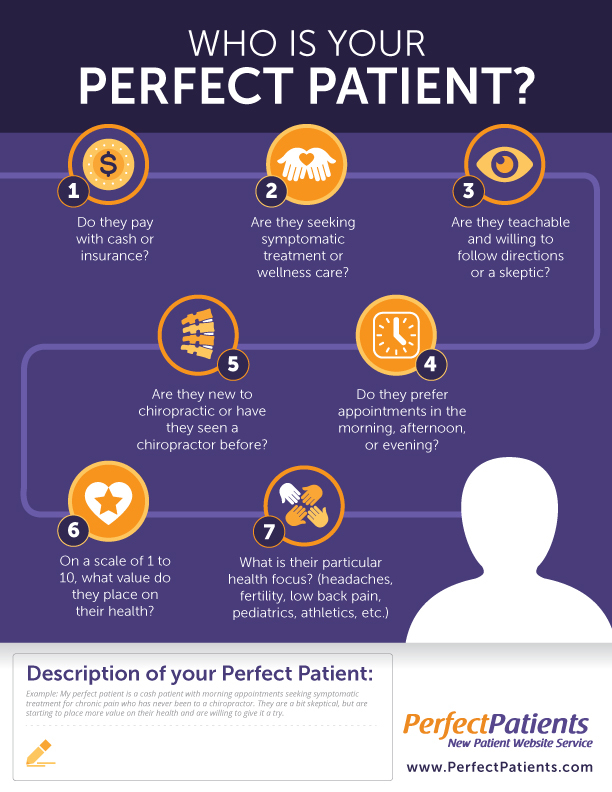 The infographic below was designed specifically to guide you through the process of identifying your perfect patient. To create your own, simply right click on the image below to save it as an image and print it off. If you prefer, this is a black and white pdf version to download. It can be difficult to know where to begin but if you follow these simple questions, then you’re on the road to filling your schedule – not with just any patient, but with perfect patients. Here is an example of how answering these questions can get you started. If you’ve gone through this exercise and aren’t sure if your practice website is catered toward your perfect patient, then sign up for a free 15-Minute Website Evaluation to find out. One of our marketing experts will take a look at your website and give you a customized review with actionable advice.